Hi! Ruby Craft here. This is my second Wednesday as guest designer on the eP Blog and I'm having a great time. 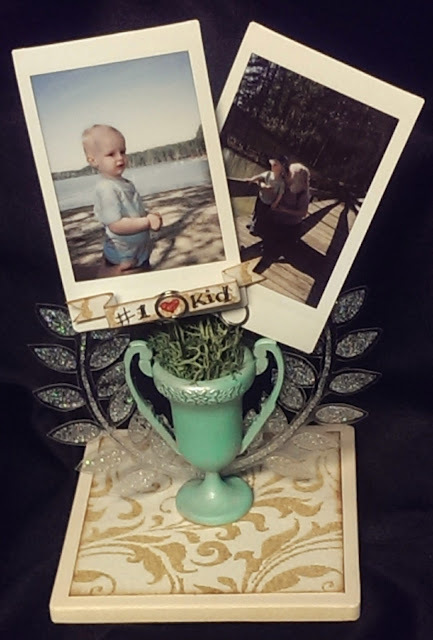 For this week I wanted to use one of the Tim Holtz Idea-ology Trophy Cups to create a desktop photo holder for pictures of my Grandson, who I think just happens to deserve a trophy for anything he does. The photos I am using here are Fuji Instax Mini instant photos and are about the size of a credit card. They already have a white border and are heavy weight so they don't need a frame. They remind me of the Polaroids my Dad had. Tim Holtz Trophy Cups were the perfect size for this project. 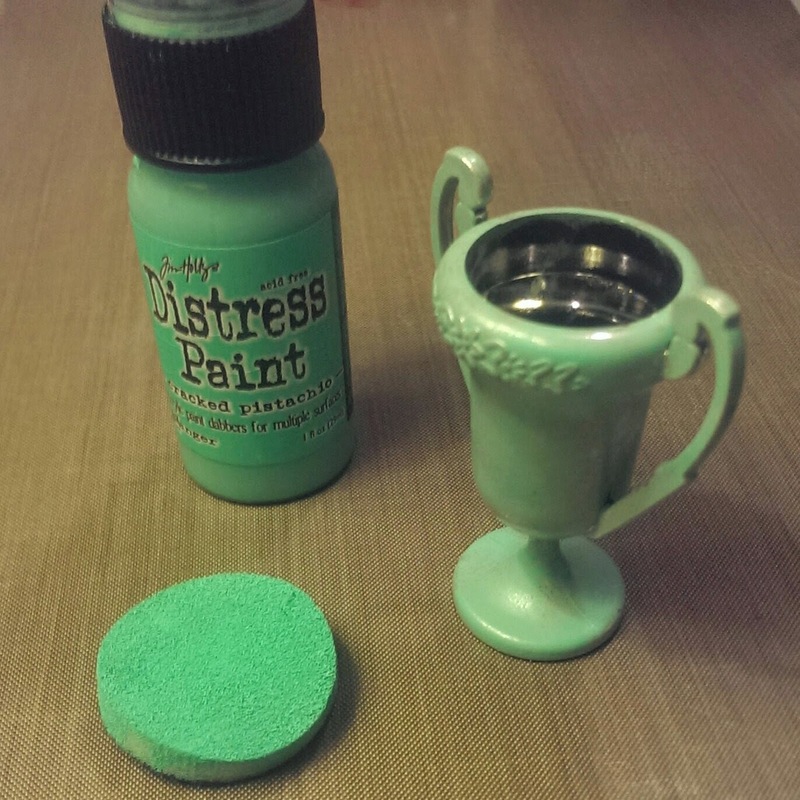 To start I used a mini blending foam and Cracked Pistachio Distress Paint to colorize the silver trophy. The blending foam allowed me to get into all the crevices and get a nice thin coat which allowed the flourish around the top band of the cup to shine through. The cup looks almost pearlized thanks to the silver finish acting as an undercoat. Since the trophy has a slick surface I decided to add a coat of Ranger Ink Glue N Seal. It gave the paint added protection and a nice sheen. The next step is to create the Laurel Leaves. 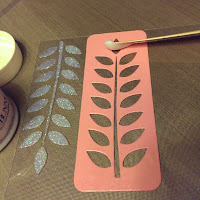 I'm using Wendy Vecchi Studio 490 Clearly for Art Modeling Film, BoBunny Stickable Stencils and BoBunny Glitter Paste in Sugar. 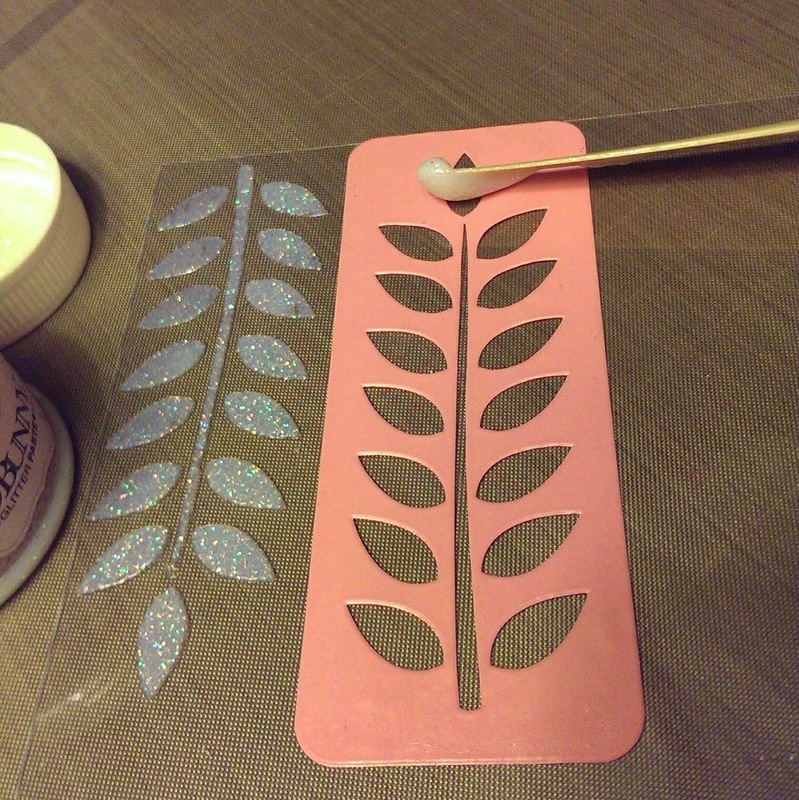 The stencils have repositionable adhesive on the back which made it easy to apply them to a sheet the Clearly for Art and then spread on the BoBunny Glitter Paste with a spatula. 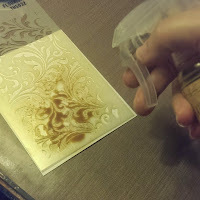 Once I had the glitter paste like I wanted it I carefully lifted the stencil and stuck it to an acrylic block to clean and then reapply it on the Clearly for Art repeating the process until I had the number of stems I wanted. Then I set them aside to dry. 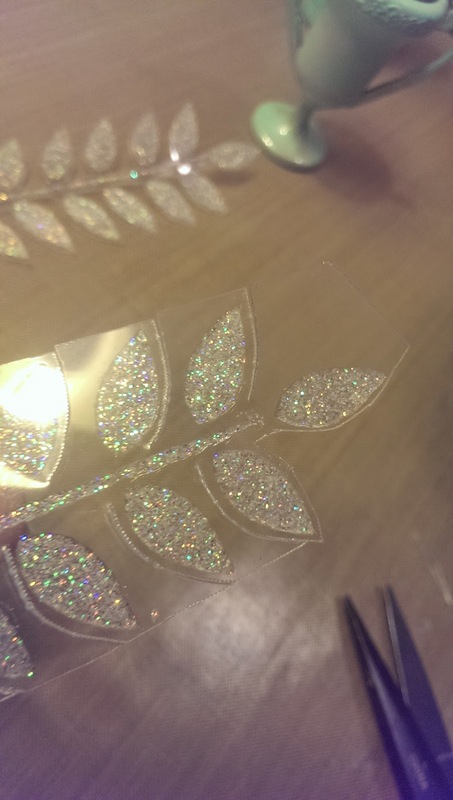 Once the glitter paste was dry I was able to trim out around the stem of leaves with scissors but cut off the bottom two leaves. This made the stem portion longer at the end. Heating them with a heat tool I shaped them into Laurels. By working in small sections I was able to mold the film into the shape I wanted. 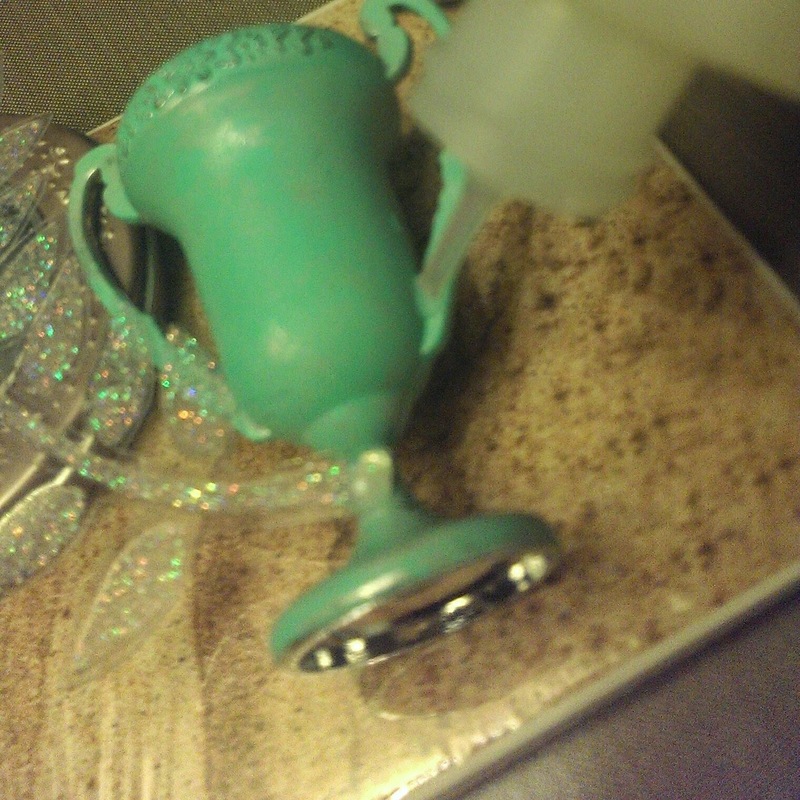 I used Glossy Accents to attach the glitter side of the film to the stem at the base of the trophy cup and the back of the trophy handles. I had to hold them in place till they were dry enough to hold. It didn't take long but it might help to use some type of clamp to hold them until they are dry. 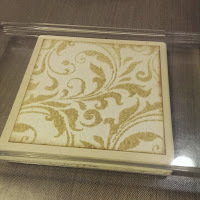 I placed the Flourish Tim Holtz Layering Stencil on a piece of watercolor paper and sprayed it with Prima Color Bloom inVintage Metal Gold Foil. 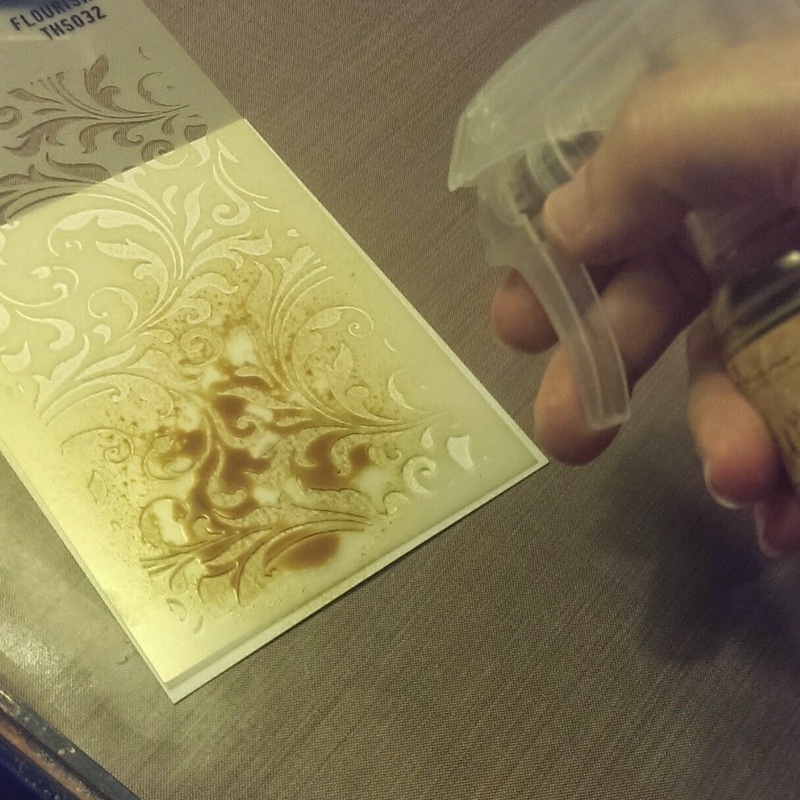 Once it was dry I cut out a square, applied some Micro Glaze with my fingertips to seal the surface and lightly inked the edges with Vintage Photo Distress Ink. 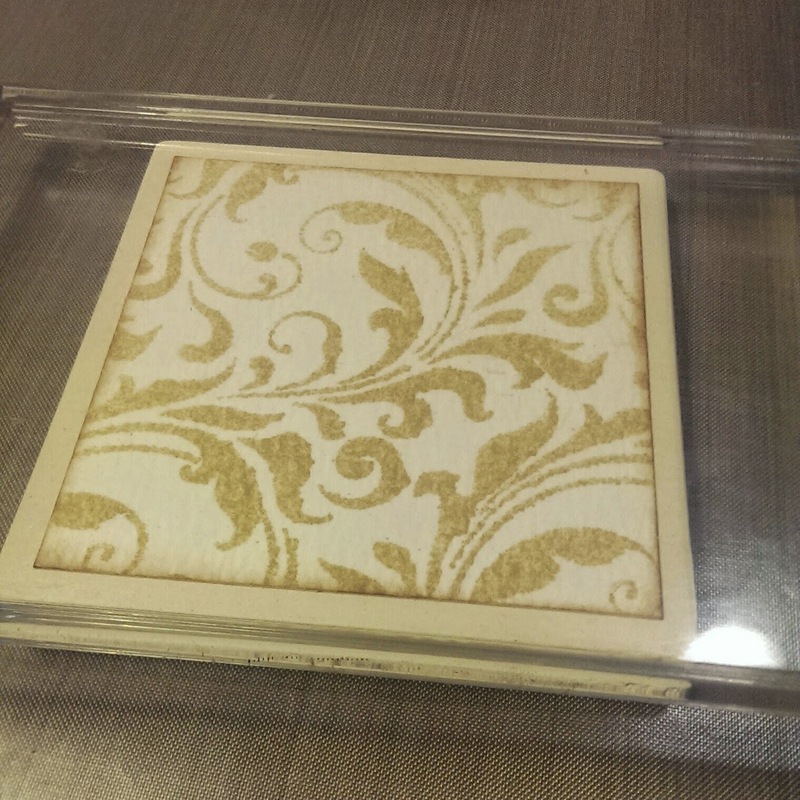 I used Ranger Multi Medium to glue the paper to a square coaster I wanted to upcycle. I weighted the paper down with a large acrylic block to help it dry flat. After allowing time for the multi medium to dry, I glued the Trophy cup to the center of the base. The coaster is small enough that it won't take up a lot of room on my desk but large enough that I won't have to worry about the trophy and photos toppling over. I already had a pack of Tim Holtz Idea-ology Memo Pins in my stash. I took a good size clump of moss (I found my moss at a dollar store) and stuffed it into the cup of the trophy so that it would be thick enough to hold the photos in position. 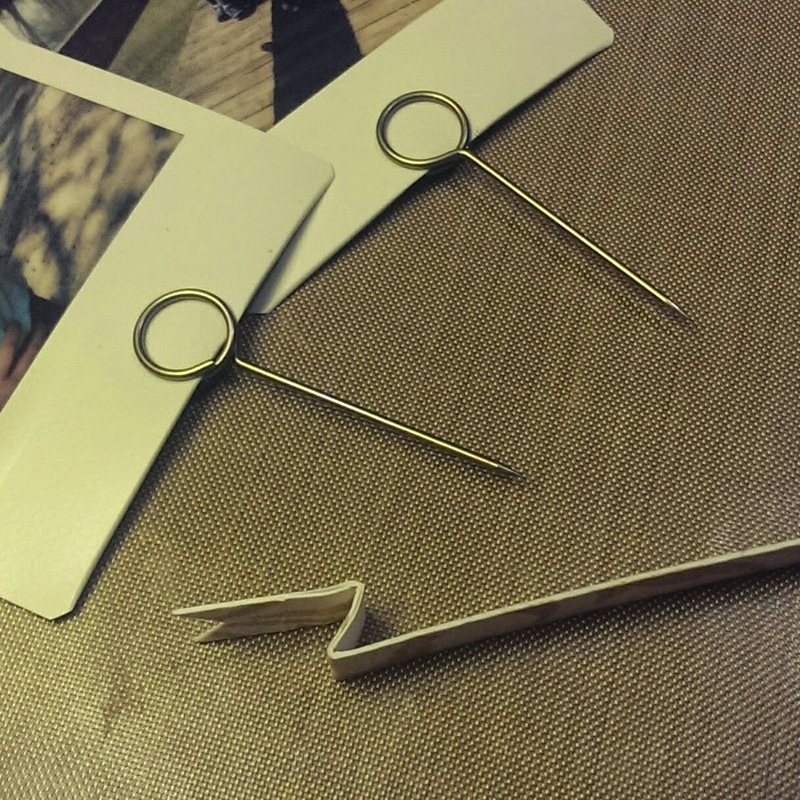 I placed 2 photos into memo pins and stuck them into the moss with the laurel leaves going behind the photos. I thought the memo pins were perfect. but you could use some mini clothes pins on little dowels or little clips on wires. 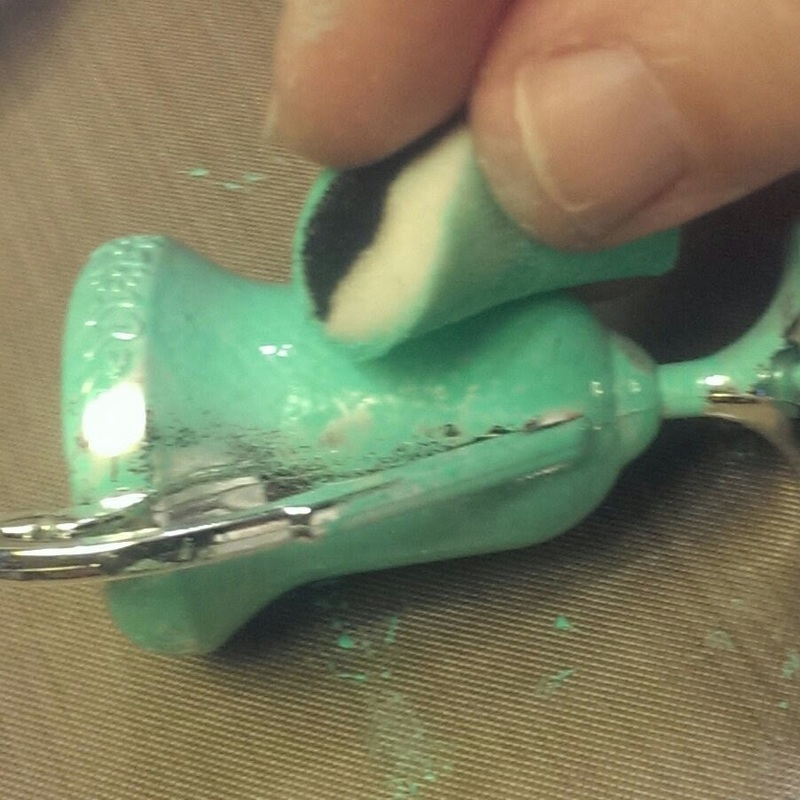 An alternative for the moss could be a cork stopper. I created a banner by cutting a thin strip from the scrap of the flourish paper, snipped the ends with the scissors. Each end was then folded twice once back and then a space about 1/16 of an inch folded forward. The edges were then inked to match the inking on the base. I hand lettered #1 Kid and drew the little heart then folded the banner ends and put it in a memo pin to place in the moss in front of the photos. My daughters really liked my desktop photo holder and I had fun making it. 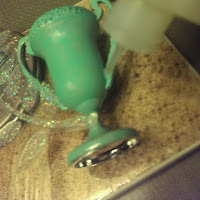 Tim Holtz Idea-ology Trophy Cups are 3 to a pack so I still have 2 left and can make them both one for their desk too. Gorgeous Ruby!!! I especially love the base with the stencil. And the pictures of your grandson are adorable. I love it Ruby! Great use of the trophy cups!! Wonderful, and just in time for graduations!